Not to be confused with G-Force: Guardians of Space. G-Force is a 2009 American family adventure comedy film produced by Walt Disney Pictures and Jerry Bruckheimer Films. Directed by Hoyt Yeatman and written by Cormac and Marianne Wibberley with a story by Yeatman, the film is his directorial debut, having earlier worked in the area of visual effects alongside co-founding Dream Quest Images. The film stars Zach Galifianakis, Bill Nighy, and Will Arnett and it features the voices of Sam Rockwell, Tracy Morgan, Penélope Cruz, Jon Favreau, Nicolas Cage, and Steve Buscemi. Sony Pictures Imageworks handled the film's visual effects. G-Force was released in the United States on July 24, 2009. It earned $292.8 million on a $150 million budget, but the critical reception was mostly negative. The film revolves around a special team of trained secret agent animals, equipped with advanced tools that allow the mammalian members to talk to humans. The primary field team consists of guinea pigs Darwin, Blaster, and Juarez, star-nosed mole Speckles (cyber intelligence), and housefly Mooch (Reconnaissance). The unit's leader Ben, orders an unauthorized infiltration of the residence of home electronics and appliances magnate, Leonard Saber, the owner of Saberling Industries, who has been under FBI investigation and is working for an unseen mastermind named Mr. Yanshu. The team is able to retrieve sensitive information about a sinister scheme that is set to occur in 48 hours. However, when Ben's superior Kip Killian arrives for his evaluation, his astonishment at the team's capabilities and technology is overcome by his indignation at Ben's unauthorized mission and the fact that the downloaded intelligence appears to be useless information about Saber's coffeemakers. As a result, the government agent orders the unit shut down, the equipment seized and the animals to be used as experimental subjects to be killed. With the help of their human compatriots, Darwin, Juarez, Blaster, Mooch and Speckles escape with hopes of stopping Saber's scheme, but find themselves in a pet carrying case bound for a pet shop. Trapped in the store's pet rodent display case, G-Force meets Hurley, a laid-back guinea pig, Bucky, an irascible hamster, and three sycophantic mice. Although Blaster and Juarez manage to get themselves sold to a family with plans to return to extract their comrades, Speckles' own attempt to escape by playing dead ends disastrously when he is thrown into and supposedly crushed in a garbage truck. Meanwhile, Mooch manages to return to Ben to tell him where his mammalian agents are, but Darwin escapes with Hurley before he can arrive to collect them. While Blaster and Juarez escape their new owners to return to Ben, he and his assistant Marcie discover that the discredited intel has a destructive computer function that apparently hid the scheme. At this time, Darwin and Hurley make their own way to their superior. En route, Darwin sees a Saberling coffee maker and decides to investigate it, but his examination of the machine makes it come alive as a dangerous fighting robot (which is similar to a Transformer) that he and Hurley are able to defeat by making it run right into the path of an oncoming SUV. Later Darwin and Hurley transport the wreckage to Ben using a skateboard. However, upon arrival, Ben confesses the shattering information that they are not special genetically enhanced animals as previously told, but ordinary ones Ben took in and trained for the team; Juarez was a delicacy at a roadside tapas stand in Pyrenees, Blaster was found at a hair and cosmetics lab where a hair gel was being tested for allergic reactions, Speckles was found before his family was killed and his home was destroyed to build a golf course, during which he became blind and had to wear special glasses to help him see, and Darwin was adopted from the pet store after his parents abandoned him because he was the runt of the litter. However, Hurley lifts them from their despair by reminding the team of the astounding feats he has seen them do and the fact that they obviously made themselves extraordinary on their own. Emboldened but with little time to stop the scheme, Ben provides the field team with the means to infiltrate the Saber residence and plant a virus in the computer mainframe. Unfortunately, FBI agents are ordered by Killian to capture the animals dead or alive, forcing the team to elude them with an extended pursuit thanks to a high speed vehicle especially designed for them called the Rapid Deployment Vehicle (dubbed the RDV by Darwin) and Mooch acting as their camera in the air. During the chase, one FBI SUV gets trapped by moving trucks, while another SUV crashes into a travel trailer, and the last one gets caught in the middle of a fireworks display, though none of the agents are harmed. After the team infiltrates Saber's mainframe, they encounter a bomb trap but they manage to avoid it because of their size. Meanwhile, Hurley notices a Saberling microwave oven, which transforms and attacks. In an appliance store, all of the machines also transform into killing machines and begin combining with each other. The microwave then tries to kill the 3 guinea pigs. The team take on the monster until it is destroyed by the bomb trap, and the resulting battle separates the group, leaving only Darwin and Mooch to take the mainframe down. At the same time, Leonard Saber is shocked to discover that his appliances have become killing machines, expecting them to simply be able to effectively communicate with each other. Meanwhile, Killian leads his men to take advantage of this obvious pretext to finally openly move against the industrialist thinking that he was the mastermind and interrogate him in the command truck. Ben and Marcie arrive at the scene and they watch Darwin trying to infiltrate the mainframe and shut it down. When Darwin reaches the mainframe, he finds out that Speckles, who actually faked his death and somehow obtained another pair of glasses after his original one was taken away earlier, is the mastermind of the plan and is also the mysterious Mr. Yanshu (the name Yanshu 鼴鼠 means mole in Chinese). Speckles explains his masterstroke: to cause a massive planetwide bombardment of space debris pulled from orbit to make the planet surface uninhabitable, admitting that he snuck into Saber's base and planted the control chips into the devices and used Sabersense as a cover for his plan, and that he was the one who sabotaged G-Force's presentation to ensure that they didn't find out about his sinister plot. He also explains that the reason behind his plot is because he wants revenge on the human race for the death of his family. Speckles promptly amalgamates the various appliances in the vicinity into a giant walking robot, which, combined with a localized bombardment of orbital debris, soon overpowers the police force and grabs the command truck, with Marcie, Killian, Saber, and Ben inside. During the fight, Speckles summons one of his robots to kill Darwin (who loses his parachute and the PDA in the process), but Darwin manages to persuade Speckles that his new family is with the rest of the team and Ben, who had taken them all in. Speckles concedes, and realizing that he has gone too far, tries to shut it down, but he has lost control and the machines continue their onslaught. Darwin uses the computer virus on his PDA (which was recovered by Mooch earlier) to take it down, destroying the robot and nearly killing Hurley while the FBI take Saber into custody. The guinea pigs are personally commended by the FBI Director who also appoints them special agents of the FBI. Furthermore, G-Force is reinstated as a unit of the Bureau and expanded with Hurley, Bucky and the mice inducted as new recruits. Meanwhile, Saber makes the largest product recall in history, Speckles is given the punitive duty of personally removing the malicious chips from all Saber products, which number into the tens of thousands, and Agent Killian is relocated to an FBI base in the South Pole as a punishment for shutting down G-Force. Sam Rockwell as Darwin (FBI Special Agent), a crested guinea pig, the head of G-Force. Tracy Morgan as Blaster (FBI Special Agent), another guinea pig, the weapons expert of G-Force. He is also Juarez's love interest. Morgan also voices one of the 3 mice. Penélope Cruz as Juarez (FBI Special Agent), a Spanish-accented female guinea pig, the muscle of G-Force. She is also Blaster's Love interest. Jon Favreau as Hurley (FBI Rookie), an Abyssinian guinea pig, and Darwin's long lost brother. Nicolas Cage as Speckles, the cyber intelligent star-nosed mole, the brains of G-Force. Dee Bradley Baker as Mooch, a housefly and member of G-Force. On 14 October 2008, Hoyt Yeatman was set to direct G-Force. Cormac and Marianne Wibberley wrote the script for the film. 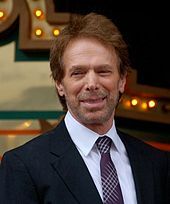 Jerry Bruckheimer produced the film with the budget of $150 million for release in 2009. On 17 October, it was announced that Sam Rockwell, Tracy Morgan, Penélope Cruz, Nicolas Cage, Jon Favreau, Steve Buscemi, Zach Galifianakis, Bill Nighy, Kelli Garner, Will Arnett, Gabriel Casseus and Jack Conley joined the film. Dee Bradley Baker joined the cast on 12 November to play Mooch, a housefly. On 18 November, it was announced that Trevor Rabin would compose the music for the film. On 23 November, Walt Disney Studios Motion Pictures acquired distribution rights to the film. Development of the film was completed in Los Angeles, California. Production then moved to Santa Clarita, California for the final phases of animation and production in order to maximize tax credits offered to foreign film projects in America. 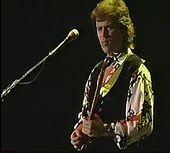 Trevor Rabin scored the music for the film and its soundtrack. The soundtrack also contains "I Gotta Feeling" performed by The Black Eyed Peas, "Boom Boom Pow" also performed by The Black Eyed Peas, "Just Dance" performed by Lady Gaga and Colby O'Donis, "Jump" performed by Flo Rida and Nelly Furtado, "Don't Cha" performed by The Pussycat Dolls and Busta Rhymes, "Mexicano" performed by Tremander, "Ready to Rock" performed by Steve Rushton, "How Do You Sleep?" performed by Jesse McCartney and Ludacris, "Falling Down" performed by Space Cowboy and "O Fortuna" performed by London Symphony Orchestra & Richard Hickox. G-Force was filmed at 992 S Oakland Avenue, Pasadena, California, USA, Culver Studios – 9336 W. Washington Blvd., Culver City, California, USA, Los Angeles, California, USA and Santa Clarita, California, USA in 2009. G-Force was theatrically released on July 24, 2009 by Walt Disney Pictures and Jerry Bruckheimer Films. G-Force was released on DVD and Blu-ray on December 15, 2009 by Walt Disney Studios Home Entertainment. 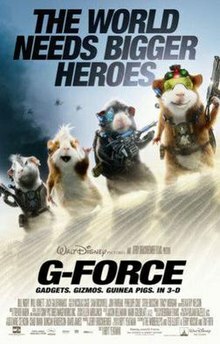 G-Force grossed $119,436,770 in North America and $173,381,071 internationally for a worldwide total of $292,810,686, against a budget of $150 million. In its opening weekend, the film earned $31.7 million, ranking at No. 1, and replacing Harry Potter and the Half-Blood Prince. The film declined −44.8% on its second week behind Funny People and Harry Potter and the Half-Blood Prince. As of January 2019, Rotten Tomatoes reports that the film has a 22% approval rating based on 125 reviews and an average score of 4.5/10. The site's consensus reads: "G-Force features manic action, but fails to come up with interesting characters or an inspired plot." Similarly, Metacritic attests the film has received an average score of 41 out of 100 based on 19 reviews. Roger Ebert of the Chicago Sun-Times gave the film 2.5 stars out of four and called it "a pleasant, inoffensive 3-D animated farce". The video game based on the film was released for PlayStation 3, PlayStation 2, Xbox 360, Wii, PlayStation Portable, Nintendo DS and Microsoft Windows on July 21, 2009. The PS3 and Xbox 360 versions come with 3D glasses. G-Force: Original Motion Picture Soundtrack is the film's soundtrack album by Various artists and was released on May 1, 2009 by Walt Disney Records. ^ a b c d e "G-Force (2009)". Box Office Mojo. Retrieved January 8, 2011. ^ Giardina, Carolyn (July 1, 2008). "'G-Force' is with Imageworks". The Hollywood Reporter. Retrieved November 18, 2017. ^ "Weekend Report: G-Force Takes Cake, Potter Plummets". Box Office Mojo. July 27, 2009. Retrieved January 8, 2011. ^ "G-Force Movie Reviews, Pictures". Rotten Tomatoes. Retrieved November 17, 2011. ^ "G-Force Reviews, Ratings, Credits". Metacritic. Retrieved January 8, 2011. ^ Ebert, Roger. "G-Force :: rogerebert.com :: Reviews". Chicago Sun-Times. Retrieved November 24, 2010. ^ "Disney Interactive Studios deploys G-Force on mission to retail shelves". Disney Interactive Studios. July 21, 2009. Archived from the original on August 2, 2009. Retrieved July 21, 2009.